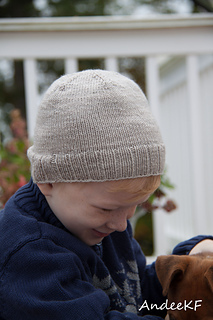 This is a basic hat with a ribbed brim. The body is done in a stockinet stitch and the decrease is done in a way to create the look of a starfish (or sea star if you prefer). This is a fun twist on a traditional beanie hat. I have made this Version I. I included sizes for 6-12 months and toddler. In the pictures I have included on this project page are of both a 7 month old and my son who is 4-1/2 years old. The toddler version of the hat is more suited for a smaller head to get the starfish look as in the picture I have of the 7 month old. But none the less it is still a great fitting hat on most ages. 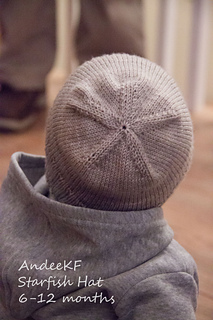 The brim is stretchy enough to allow the hat to grow with you. As I knit more sizes of this hat I will post them and the patterns. I can’t wait to see everyone’s versions of this hat!